Alarm monitoring unit able to monitor up to 12 contacts. Thanks to its simple technical design, the AS 2000-1 lends itself very well to the extension of existing controls and switching systems. Incoming alerts are fed into a repeating relay which can then trigger a horn signal, for example. An externally fitted button is used to acknowledge the alarm. A superordinate composite alarm unit or remote alarming unit can be used instead of a horn. Once an alarm contact closes, the alarm lamp will light up. 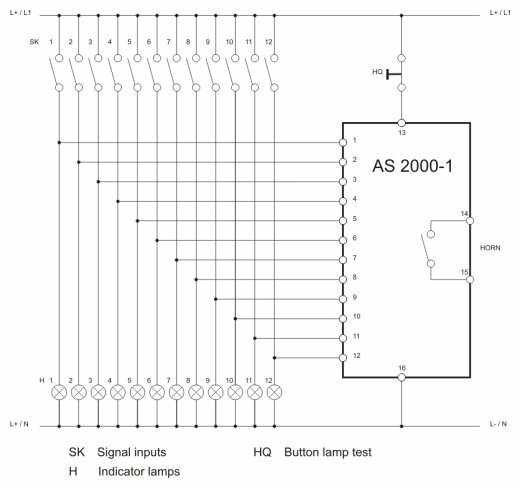 At the same time, the same alarm contact drives the AS 2000-1. The horn relay receives a pulse through an RC combination and switches into self-holding operation. The potential-free contact via terminals 14-15 closes, whereupon the horn sounds, continuing to do so until the HQ (acknowledge horn) button is pressed. The same process occurs for each new alarm even if the first alarm remains active. Pulse-type alarms are stored in acoustic form and are only indicated visually for as long as the fault remains.